Blowing leaves might be one of the most common way to remove leaves, but there’s a better way to clean up your lawn. In our continuing Fall Lawn Care Playbook series we’ve been working through all of the different ways you should care for your lawn throughout the season. With the first official day of winter just a few short weeks away you probably notice fewer leaves on the trees and more on your lawn. Last time we talked about how important it is to have leaves removed, but we didn’t discuss how to go about it. You could grab the rake and get to it, but that’s time consuming and not the most effective method. One of the most common methods for leaf removal is the trusty old leaf blower. Able to clean up large areas in no time at all, leaf blowers are the top choice for anyone cleaning a lot of yards or just a few exceptionally large yards. Leaves are usually blown into a corner of the property and then bagged for removal, unless you have a wooded area to blow them into and skip the bagging. 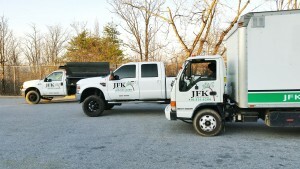 The most efficient way to have your leaves removed is to call in JFK Lawn and Landscape. We use commercial leaf vacuums that shred the leaves and blow them into the back of our removal truck. Once the truck is full, we pay to dispose of them at the county landfill, where they’re recycled. This is great for you, because you don’t have to worry about any lawn debris hanging around. Plus, it’s great for the environment since the leaves are recycled instead of mixed into other trash, which makes it harder for the natural materials to break down. 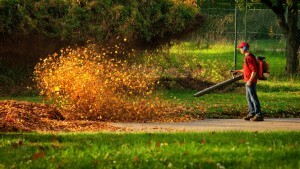 Sometimes it’s best to skip the rake or leaf blower and head straight for the lawnmower. Fallen leaves still have some benefit to your lawn as a kind of fertilizer. The difficulty is knowing how mulched the leaves need to be, and how much you should have on your lawn. Too much and you can hurt your lawn, too little and your lawn looks messy without any advantage. A lawn care professional will know if your lawn needs the extra help, or if the leaves should just be removed. Leaf removal isn’t just for residential properties. All types of businesses can benefit from having the leaves removed. From a cleaner and more professional looking property and parking lots to less debris being tracked inside, your business will benefit from professional leaf removal. This entry was posted on Friday, December 2nd, 2016 at 8:17 am. Both comments and pings are currently closed.